Whether you’re a sophisticated singleton on the hunt for style and spec, a family looking for trouble-free car ownership, or a company car driver watching your benefit-in-kind – you should consider the Toyota Auris. Here’s 10 reasons why. With sharp looks; impressive levels of equipment; low running costs and a renewed focus on driving dynamics – the Toyota Auris is all the car you’ll ever need. We take a look at 10 reasons why you should consider giving it a try. You’re spoilt for choice when it comes to choosing an engine to power your Auris – it’s the only model in the ‘C’ segment to be offered with a choice of petrol, diesel and full hybrid powertrains. There are four engines available – a 98bhp 1.33-litre Dual VVT-i petrol; 130bhp 1.6-litre Valvematic petrol; an 89bhp 1.4-litre D-4D engine and a 134bhp 1.8 litre VVT-i petrol and electric hybrid. The Auris is produced by Toyota Motor Manufacturing UK (TMUK) at its Burnaston plant, near Derby. 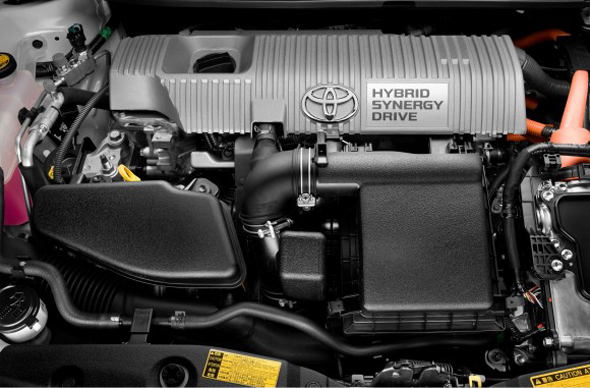 Meanwhile, the petrol engine fitted to hybrid models is manufactured by TMUK at Deeside in North Wales. 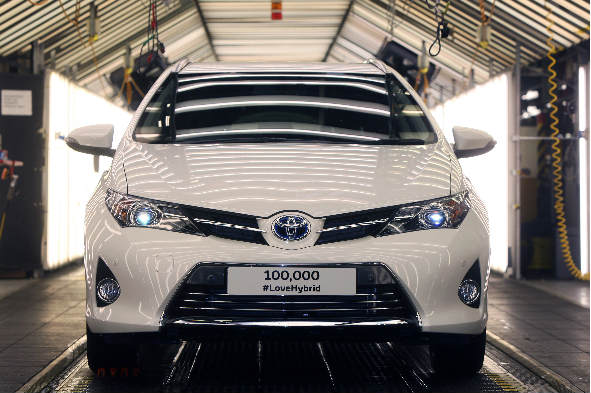 Burnaston is the country’s fastest-growing vehicle plant and is now producing a quarter of all the Toyotas sold in Britain – and exporting many more. Each year Toyota in Europe is spending around £850 million with its UK suppliers. This is important because doing so creates and secures jobs in the UK’s burgeoning manufacturing sector. 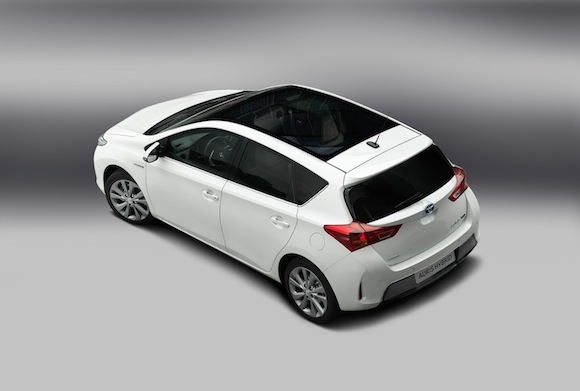 The Auris Hybrid boasts class-leading CO2 emissions which start at 84g/km. All hybrid variants dip below the magic 100g/km barrier, so are exempt from annual road tax (Vehicle Excise Duty). Petrol and diesel variants of Auris benefit from emissions-cutting stop/start technology. An array of cutting-edge technology – found on the options list of many rivals – is fitted as standard on selected Auris models. All models bar entry-level ‘Active’ grades feature Toyota Touch 2, which includes Bluetooth, a Rear View Camera, USB and iPod connection. Icon Plus and Excel models gain Toyota Touch 2 with Go which adds navigation and Google Street View™ and local search. The system is also the first of its kind to feature Panoramio™, which provides imagery of the vehicle’s location or a chosen location to help pinpoint and recognise destinations. An Intelligent Park Assist system – fitted as standard to Excel models – makes light work of parallel parking. Activated using a button on the centre console, it uses ultrasonic technology to determine whether a parking space is large enough for the car and then steers the car into the parking space, while the driver controls the accelerator and brake. The current-generation Auris is 55mm lower than its predecessor. Reducing the car’s overall height by 55mm means that it not only benefits from a sportier silhouette than before, but it also slips through the air with less effort than its predecessor – reducing emissions and increasing fuel economy. Drag coefficient has been reduced from Cd 0.292 to Cd 0.277. Much like the GT86 sports coupé – which has been universally praised for its sublime driving characteristics – Auris has a low centre of gravity. Cars with a low centre of gravity are exposed to less body roll – delivering a significantly more involving drive in corners. Furthermore, the driving position of the current Auris is up to 40mm lower than its predecessor. A quick trawl of owner reviews on automotive news and reviewing website Honest John reveals just how much adoration Auris owners have for their cars. One user writes: “There is only one word for this car. Brilliant! Another user, ACKERKENTON, writes: “My Auris is a brilliant town & motorway car, extremely quiet at high speeds and still good on fuel. 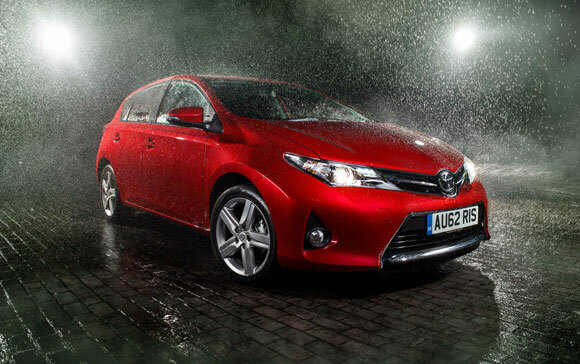 Watch Auris Hybrid Excel owner, Chris Pickup, tell us what he thinks of his car below. A ‘Skyview’ panoramic roof is available for Icon Plus and range-topping Excel models and is one of the largest in the small family car class. Leather upholstery is available as an option on Icon, Icon Plus and Excel grades. For a dose of genuine luxury, a full black leather interior with white or blue contrast stitching is available as an accessory. If entertaining back seat passengers is a priority, a dual screen DVD system is available as a dealer-fit option. You can add greater ambience to the cabin with a footwell illumination kit that bathes the lower section of the cabin in soft blue light. Right now, Auris Icon models are available to retail buyers with a £2000 deposit contribution with a low representative APR of just 4.9% in petrol, diesel and hybrid variants. Business users can get behind the wheel of an Auris Icon 1.4 D-4D or 1.33 VVT-i from £169 p/m + VAT with an initial rental of £1,014 + VAT. 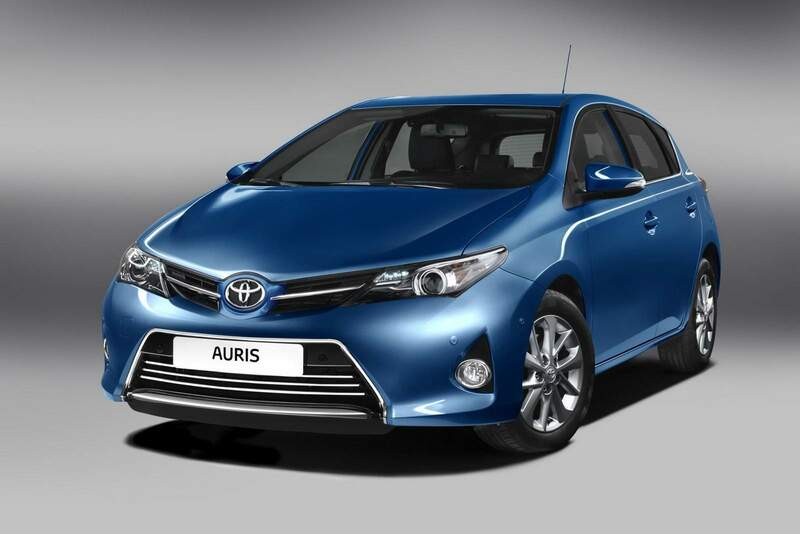 Company car drivers will delight in the knowledge that Auris has a benefit-in-kind rating of 11 per cent. 10. They’re selling like hot cakes! Few things demonstrate just how good a car is better than people actually buying them – and people have been buying Auris in their droves! In March this year, the car recorded its best-ever share of the c-segment, grabbing 5.7 per cent.